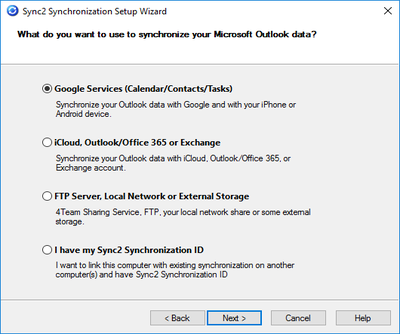 Sync2 is using Google services, such as Google Calendar and Gmail Contacts, as intermediaries, in order to synchronize Android device with Outlook. So, in a few simple steps outlined below you will able to set up Microsoft Outlook synchronization with Android on your computer. Sync Calendar and Contacts from Outlook to Android phone or tablet. Keep your Android with Outlook Contacts and Calendar up to date and in sync at all times. 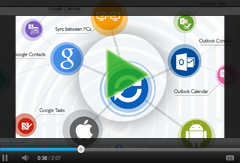 Transfer your contacts from Microsoft Outlook account to Android device and vice versa. Sync2 will keep your Outlook and Android devices in sync automatically. Sync Android Contacts and Calendar with Outlook 2016, 2013, 2010, 2007. Just remember to adjust your tablet or phone settings to allow the synchronization with Google account(s). Click “Finish” to complete the Sync2 synchronization profile. Note: you will still need to connect your Google account (or create one) to your Android device to begin the synchronization process. To learn more about how to set up your Android device with Google account, click here. Just in a few moments your data will be synchronized. Thousands of customers worldwide trust our Sync2.